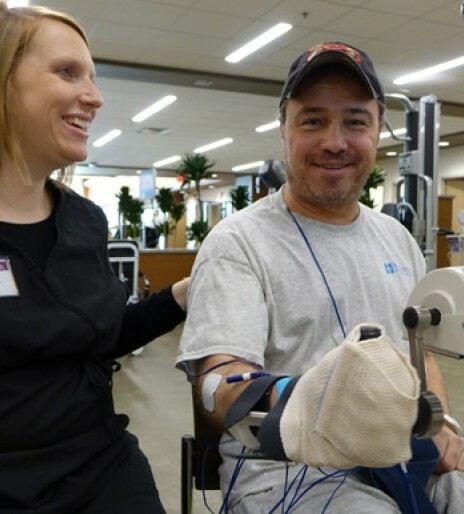 Joe Schwappach is restoring function in his right arm and hand with the help of the FES Bike, which provides small, electronic pulses to help stimulate muscles in arms and legs. This after undergoing surgery to repair a left bicep tendon rupture which resulted in a massive stroke affecting his right side. "It was just a simple in out procedure, go home, giddy up. I would take a couple weeks off and then be done with it. And all of a sudden it’s this catastrophe here," said Joe Schwappach, a stroke survivor. "I had no movement in my leg at all and absolutely no movement in my hand at all," said Joe. But through specialized equipment during occupational therapy sessions along with physical therapy, Joe is regaining function on his right side. He says his speech has also come a long way. "When I was here I couldn’t get two words out. I couldn’t get anything out really. It was just bits and pieces. It was starting to come back but nowhere to where it is right now," said Joe. Speech improved, pictures of his family decorate Joe’s hospital room, serving as constant reminders on his top priority. "That’s my number one goal right there is to get home. Just stick with it. You’ll be able to get over it. it may take a long time, but you’ll get through it," said Joe. Learn more about Madonna's specialized stroke recovery program.